If you ship large quantities of goods, or ship goods that need to be protected during transfer and safely delivered then chances are you will use pallets to do this (unless your product is very small, for example bolts and screws, or very large like big machinery) Using pallets makes shipping more secure and, more importantly, is the most cost effective way, maximizing space. The best LTL freight rates can be obtained by transporting goods throughout North America using pallets. With standard pallet sizes it is easy to calculate how much your shipping is going to cost and also know exactly how many can be fitted onto a trailer or container. Your carrier will be happy too, as this method of shipping eases the handling and storage space needed, pallets occupy air-space as well as floor space so maximizing occupancy of any warehouse or container. An all-around more efficient way to ship and deliver. Pallet size varies around the world, Europe has a standard pallet size, as does Asia and North America. In North America the standard pallet dimensions of 48 x 40 have been popular since the 1960s and is on the ISO (International Organization for Standardization) approved standard pallet size list of 6. For suppliers of fast-moving consumer goods (FMCG) the GMA pallet (Grocers Manufacturers Association) is considered the standard pallet size dimension, in North America. Having said this, pallet size can vary according to the type of products being shipped. While the standard pallet size of 48 x 40 may be used for grocery products and many others, the next most common size is a 42 x 42” pallet, which is commonly used to ship articles such as paint. The third most common pallet size is the 48” x 48” pallet which is commonly used for larger containers such as drums. The retail industry often opts for the half pallet (48” x 20”) as they find it benefits supply and sales. There are so many options available it is probably best to communicate the exact pallet size to your suppliers or shippers so that there are no misunderstandings or surprises when goods arrive at their warehouse. This way they are prepared and know beforehand if they have the right equipment necessary to handle the goods. The standard pallet sizes talked about above should help in deciding what pallet best suits your product or industry, however, it is not only about pallet size or dimension – if only! There are many, many types of pallets made from varying materials and with standard pallet heights, width and thickness which need to be considered. Stringer Pallet – so called because it uses boards (called stringers) to support the weight of the load. The stringer boards are sandwiched between the top and bottom layer of boards. (You may sometimes see what appears to be a stringer pallet being referred to as a “Skid” pallet – this is simply a stringer pallet without a bottom deck). A 4-way stringer pallet is common, and simply means that it has a four-way entry for the forklift. Otherwise, a 2-way pallet, as the name suggests, has forklift entry from only two sides. Block Pallets - Block Pallets have 4-way entry allowing for mechanical lifting on all four sides. Solid wood, plastic or plywood is typically used. The standard formation would be 4-12 blocks which support the top boards. A block pallet can be made either with a bottom deck or without. Both these types of pallets can have variations in deck board dimensions and configurations where spacing between boards or the number of boards vary. Other variations may be in the type of materials used, where variants from plywood to oriented strand board can be used and sometimes synthetic foam can be used instead of blocks, when cushioning is needed for the goods. With all the information out there about pallets, how do I know which is the right pallet for my business? You should speak to your carrier who will help you with this important decision. Together you will decide on the best size for the products you ship. Pallet size consideration is determined by the volume of your goods and how much they weigh. Do all pallets weigh the same? The weight of the pallet will depend on the type of material used in the pallet, if it is made of wood then the moisture content of the wood needs to be considered too. Having said that, a standard pallet weighs between 30 – 48 lbs. What can I do with my unused pallets? Usually your supplier of pallets will have a service where they pick-up unused pallets – so you don’t have a warehouse full of empty pallets. Some suppliers leave a trailer at your warehouse and when filled with empty pallets they pick it up. How much can a pallet hold? 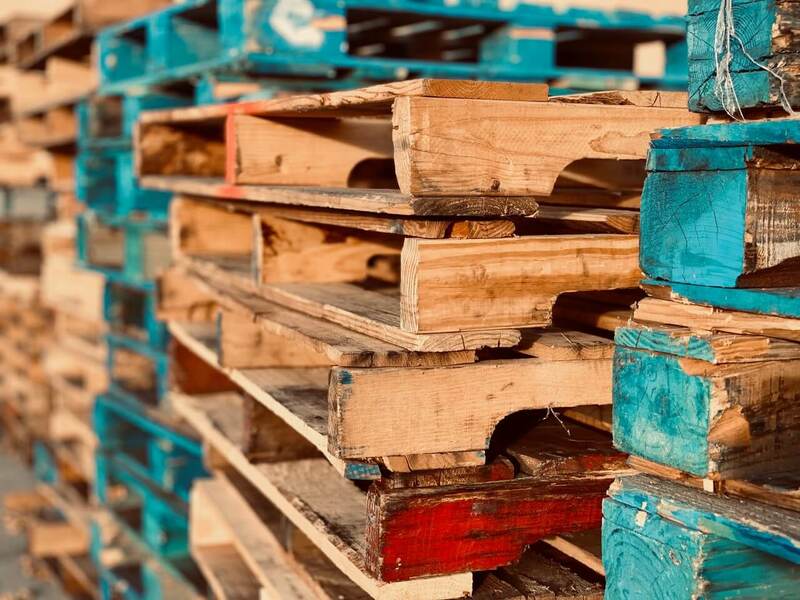 Remember that wooden pallets can be recycled and reused and with people becoming more environmentally aware it is always something to be mindful of. Fun Fact: The lifespan of a standard pallet is 7 years! !